So I hail from the province of Pangasinan and Lingayen is its capital. It's about an hour and a half drive from my hometown Laoac so I don't go there very often. What with the price of gas skyrocketing nowadays. The last time I went there was a year ago. You can read my post here. Yesterday, my youngest brother invited us to go with him to Lingayen to buy fish sauce. He has this small business of buy and sell fish sauce and Lingayen is well-known for its export quality fish sauce. Hubby didn't want to go so he stayed in the house and I went to have a joy ride. After buying the fish sauce, we went to see some of Lingayen's attractions. First stop was the Narciso Ramos Sports and Civic Center (NRSCC). We just love the view of the pond in the vicinity of the building so we took some pics there. My nieces and I had a couple of pics in front of the NRSCC building. Then we proceeded to the Pangasinan capitol building to take some pics in front of the giant Christmas tree. The decorations are so simple and not as pretty as last year. 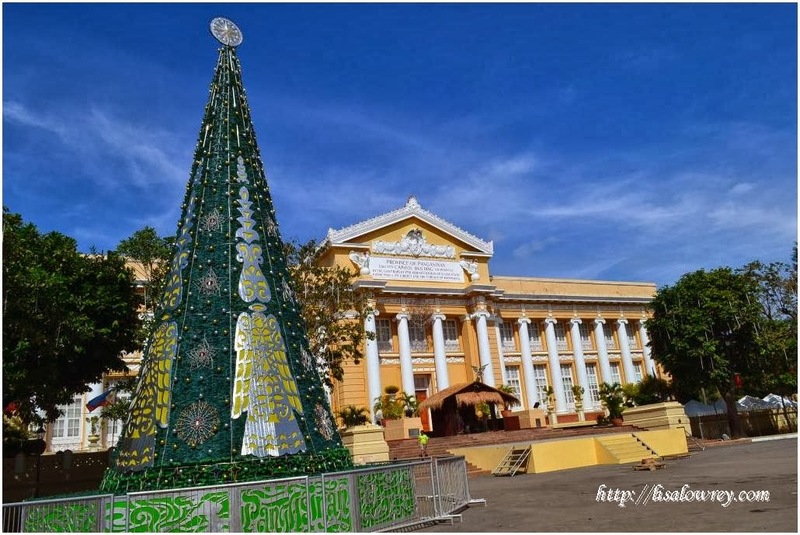 Perhaps the admin didn't want to spend lavish decorations due to the catastrophe brought by typhoon Yolanda in the country. We went up and take a look of the landscaping of the capitol building. There were bushes neatly trimmed and carabao grass on the ground. A bunch of Philippine flags adorned the surroundings. At the compound of the capitol building is the Lingayen Gulf War Memorial and my two nieces insisted to stop there so of we went to see those relics which remind the people of the last World War II like fighter plane, Japanese tanks and US cannon. These stuffs are beautified by the beautiful landscape along the capitol compound. The last stop was the Lingayen beach but then my brother parked the van a few meters away so we did not really see the beach up close. Ka inggit naman, you are with your pamangkins. Biglang miss na miss ko lalo ang mga pamangkin ko na nandyan. Looks like you had fun acting tourists hihi. Oo nga Juliana, I had fun with my 2 pamangkins. Lab na lab ko sila at sobrang nag-enjoy sila sa outing namin.